How we come up to this idea? We or Filipinos is now on the era what we called the "OFW PHENOMENON". Because of rapid growth of economy and we want a good source of income for our family, we go abroad to work. But this has an implications and consequences and one problem we see is that if affects the Family, not only physically but also emotionally, psychologically and spiritually. Husband-wife relationship is significantly strained. And parent-child relationship tremendously suffers too. But this problem can be solve, how? if we put a middle man on it, and who is the best middle man? The Ministry!!! and who are this ministries, this are the priets, missionaries, pastors etc. that can give guidance or stand in between the OFW and its family. The local ministry has the relational resources to adequately care for OFWs and their families by there guide. 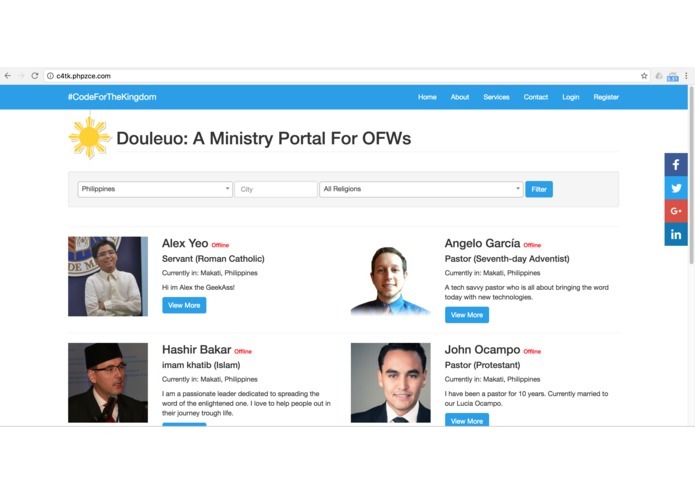 Enable to search for ministry nearest to OFWs and Families to reach out. Contact directly the ministry via direct message or sms. Ministries has also expenses, we can help them, how? via donation, we provided a donation feature. Ministry is also a human being, they also feel how an OFW feel so we provide a report for the ministry to locate nearest OFW/Member of the site. I keep on running into technical difficulties with dependencies and manipulating HTML elements enclosed in multiple divs. Its not easy to be an OFW specially long distance with your family but there are always good people willing to serve and help that can easily reach out by the technology and tools we have today. Advance Search like sphynx search/lucene search. Mobile app based. Artificial intelligence for tracking fraud entries.